WASHINGTON – From parades to somber ceremonies and a moment of silence, Americans will recall the sacrifices of military personnel who paid the ultimate price for freedom on Memorial Day, Monday, May 31. President Obama will speak at VA’s Abraham Lincoln National Cemetery in Elwood, Ill., near Chicago, on Monday. Vice President Biden will lead the observance at Arlington National Cemetery, with VA Deputy Secretary W. Scott Gould in attendance. For the dates and times of Memorial Day weekend programs at VA national cemeteries, visit www.cem.va.gov. More than 100,000 people are expected to attend activities at VA's national cemeteries, with color guards, readings, bands and choir performances. Events will honor about one million men and women who died in the military during wartime, including about 655,000 battle deaths. Some national cemetery observances are unique. At VA’s Great Lakes National Cemetery, near Dearborn, Mich., Memorial Day will begin when a horse-drawn caisson brings a flag-draped coffin holding the cremated remains of 17 Veterans long unclaimed by families or friends for burial with full military honors. Those Michigan Veterans fought in wars from World War II to Vietnam. Thanks to the Dearborn Allied War Veterans’ Council, whose members worked for months to match identities with military records, the 17 Veterans’ remains are moving from shelves in local funeral homes to their final rest in honored grounds. On May 30, at Riverside, Calif., National Cemetery --VA’s busiest -- volunteers will read aloud the names of more than 5,500 people who were buried there since last year’s Memorial Day. VA maintains approximately three million gravesites at its 131 national cemeteries and has the potential to provide six million graves on more than 19,000 acres. 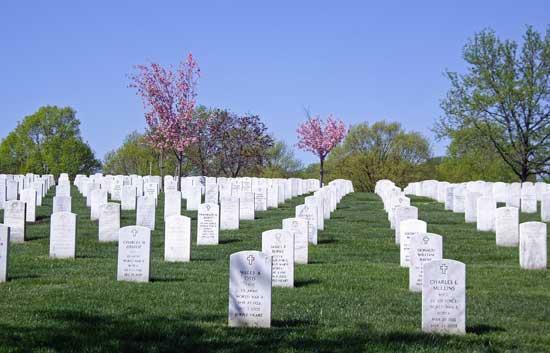 In 2009, VA conducted more than 106,000 burials in its national cemeteries. The number of annual interments is expected to increase for the next three years. This year’s budget for VA national cemetery operation and construction is $417 million. Information about Memorial Day, including its history, can be found at www.va.gov/opa/speceven/memday/. VA is a cosponsor with the White House Commission on Remembrance of an annual Moment of Remembrance at 3 p.m., local time, nationwide on Memorial Day, a time to pause and reflect on the sacrifice of America’s fallen warriors and the freedoms that unite Americans. Many institutions will announce a pause in their activities -- from sporting events to public facilities -- to call the nation together in a bond of silence. Memorial Day was originally called Decoration Day when the tradition of decorating Civil War graves began in 1866. It still brings loved ones to the graves of the deceased, often with flowers as grave decorations. To honor Veterans buried in national cemeteries, VA staff and volunteers, typically place American flags -- either individual small ones on each grave, usually placed by volunteers, or “avenues of flags” flanking both sides of the cemetery main entrance road. Often these flags are the burial flags donated by next of kin of Veterans buried in the cemetery. By 1865 the practice of decorating soldiers' graves had become widespread in the North. General John Logan, National Commander of the Grand Army of the Republic--the society of Union Army veterans--called for all GAR posts to celebrate a "Decoration Day" on May 30, 1868. There were events in 183 cemeteries in 27 states in 1868, and 336 in 1869. The northern states quickly adopted the holiday; Michigan made "Decoration Day" an official state holiday in 1871 and by 1890 every northern state followed suit. The ceremonies were sponsored by the Women's Relief Corps, with 100,000 members. The Memorial Day speech became an occasion for veterans, politicians and ministers to commemorate the war--and at first to rehearse the atrocities of the enemy. They mixed religion and celebratory nationalism and provided a means for the people to make sense of their history in terms of sacrifice for a better nation, one closer to God. People of all religious beliefs joined together, and the point was often made that the Germans and Irish soldiers had become true Americans in the "baptism of blood" on the battlefield. By the end of the 1870s the rancor was gone and the speeches praised the brave soldiers both Blue and Gray. By the 1950s, the theme was American exceptionalism and duty to uphold freedom in the world.